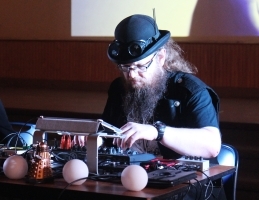 The electro-music(TM) festival is the world's premiere event for experimental electronic music. Now in its 12th year, this three day conference/music festival includes concerts, seminars, demonstrations, jam sessions, a swap meet, and a laptop battle. 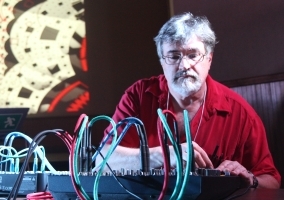 The scope is very broad, covering all aspects of electro-music: experimental electronic music, circuit bending, computer music, electro-jazz, modular synthesis, musique concrete, improvisation, algorithmic composition, multi-media, visual art and much more. The focus will be on participant involvement, sharing, community development, audience education, and great music. You can actively participate in electro-music 2016 by performing music or visuals, giving a seminar, workshop, or demonstration, joining the jam sessions, or by volunteering to help with various tasks. Please see How to Participate for instructions. Collaborations are special performances arranged for this event, featuring musicians who don't normally get a chance to work together. Participants in each collaboration are selected by the leader. Seminars and demonstrations are one-hour presentations, workshops are two-hour hands-on sessions. Spontaneous jam sessions may happen at any time during the event - there will be a room with a sound system available for open jams in the evenings. Everyone is invited to participate in the jams - you don't need to be a performing artist. Just bring your instrument and a cable to connect to the sound system. Swap meet tables will be set up throughout the weekend, where attendees can buy, sell, or trade musical gear. Label your items for sale with your name and the price. 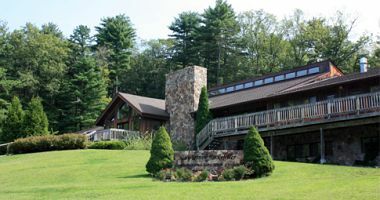 Location: The Greenkill Retreat Center is a beautiful facility near the tri-state area of New York, New Jersey, and Pennsylvania. It is conveniently accessible from major highways, and not far from Newark International Airport. Lodging and food will be available on-site. We will have full use of the facilities including two stage areas for performances, and rooms for seminars, demonstrations, and jam sessions. 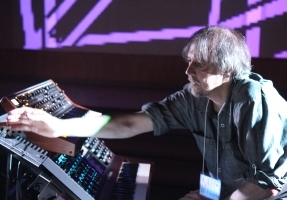 The majority of the activities at electro-music 2016(TM) will be contributions of members of electro-music.com, an international community of composers and musicians that share a passion for electro-music. electro-music.com is a place where artists and musicians meet, collaborate, support each other, sell CDs, and nurture their audiences. The community exists to create its own critical mass; to enable its members to develop music on their own terms. Electro-music is new music; still undefined; happening all over our planet. 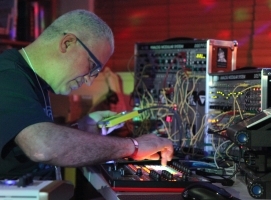 Electro-music is the natural result of techno/social trends: the availability of low-cost powerful electronic music technology, and the communication revolution enabled by the internet. Electro-music is not defined by a particular style or sound, but by its primary motivation being the joy of creation, and the love of electronic sounds. 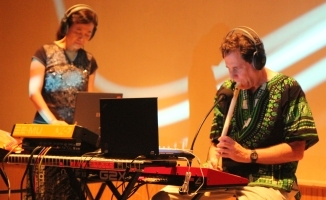 It can be slow and spacey, or fast and rhythmic; it crosses many genres. electro-music 2016 will build on the success of the previous electro-music events. Participants found them to be ground-breaking and inspirational experiences. Learn about the past events here. Check the photos and read the testimonials. Participate in the forum discussion here. Celebrating our tenth anniversary, we expect this to be a very special event. Don't miss it!